The Supreme Court heard oral argument in two cases on Wednesday, October 8, in the first week of the October 2014 Term. As I hope to do all Term, I’m predicting the winners of the Supreme Court cases based on the number of questions asked during oral argument. It’s well established that the advocate who receives more questions during oral argument is more likely to lose. For more about this method, see my post on last Term’s Aereo case. Integrity Staffing Solutions, Inc. v. Busk presents the question whether time spent in security screenings is compensable under the Fair Labor Standards Act, as amended by the Portal-to-Portal Act. My prediction is that the Petitioner Integrity Staffing Solutions will win. The Respondent Busk received almost twice as many questions as the Petitioner (51 to 27 questions), and 11 more questions than even the total number of questions for the Petitioner and U.S. Solicitor General (who supported the Petitioner’s position) combined. 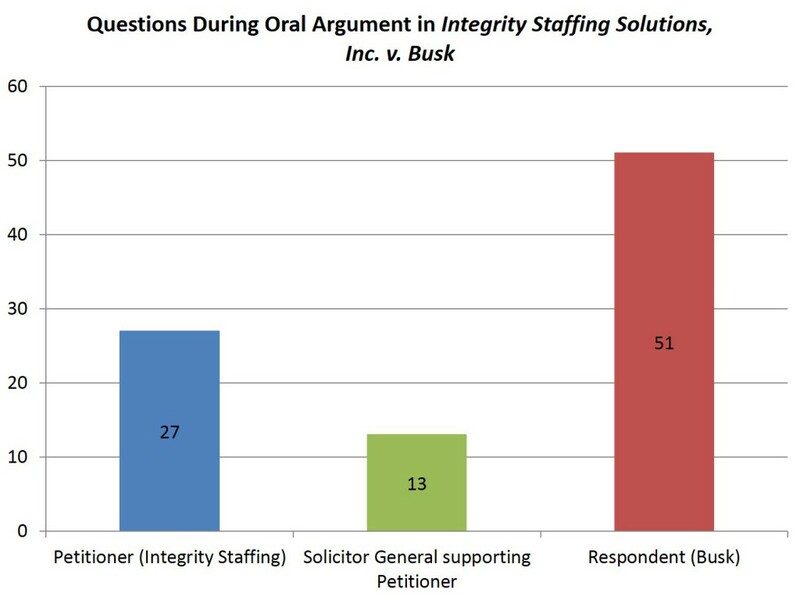 The question count strongly suggests a victory for the Petitioner Integrity Staffing Solutions (which argued that the time spent in security screenings is not compensable under the FLSA). The second case, Warger v. Shauers, raises the issue whether Federal Rule of Evidence 606(b) permits a party moving for a new trial based on juror dishonesty during voir dire to introduce juror testimony about statements made during deliberations that tend to show the alleged dishonesty. This is an easy case to predict, given the large disparity in the number of questions asked to the parties. 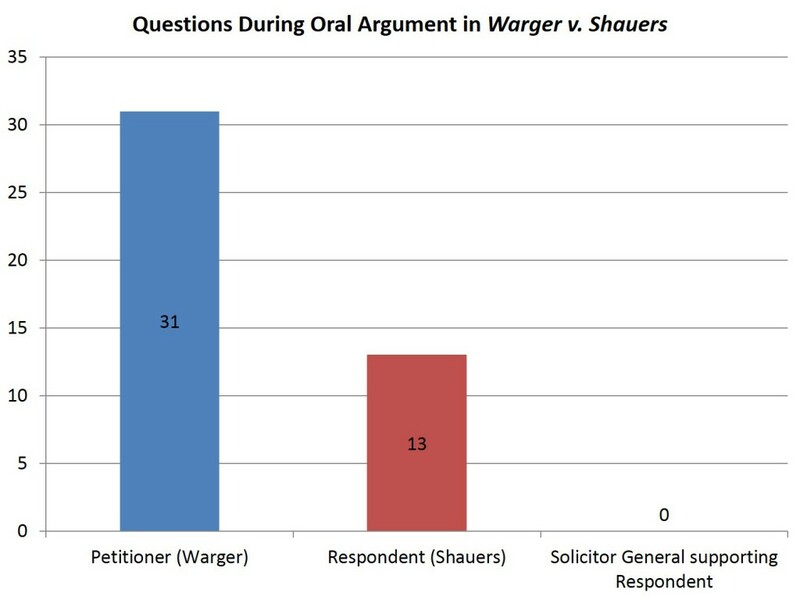 The Petitioner Warger received more than twice as many questions than the Respondent and U.S. Solicitor General (who supported the Respondent’s position) combined (31 to 13 questions). The attorney for the Solicitor General’s Office in fact received no questions at all—a rarity during oral arguments. The huge disparity in the number of questions points to a victory for the Respondent Shauers (who argued that Rule 606(b) precludes evidence of juror testimony about statements made during jury deliberations even if it relates to juror dishonesty).